The Embassy of France in Seoul, supported by the French Ministry of Sports, helped host the first Festival of Sports in Korea from Sept. 14-27. During the celebration, a series of sports and outdoor events were organized throughout the country, including petanque, basketball, soccer, futsal, rugby and hiking, among other sports. The exchanges involved the French and Korean alike and spurred competition as well as camaraderie between the two sides. 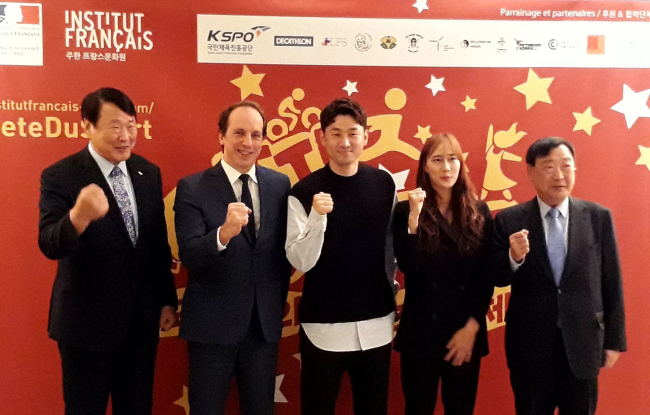 In Korea, the annual event aims to promote friendly links between local French and Korean people, and strengthen bilateral sports cooperation as specified in an agreement signed by the French and Korean sports ministers during the PyeongChang Winter Games. Several memorandums of understanding have been signed by the two countries’ sports federations, including canoeing-kayaking this year, and several Korean sports federations have expressed interest in joining in partnership with French counterparts, according to the diplomatic mission. Korea is the first country with which France has organized the bilateral sports collaboration program. Penone said sports such as fencing, golf, cycling, taekwondo and ice skating have much potential for further cooperation with Korea. This year’s partners are the Korea Sports Promotion Foundation, French-Korean Chamber of Commerce and Industry, Korea National Diplomatic Academy, Lycee Francais de Seoul, Lycee International Xavier and Seocho High School, Korean Federation of Petanque and Petanque Korea, Seoul Innovation Park, Millenium Hikers, Han River Pirates (rugby), FC Cannon Shooters (futsal) and companies Pernod-Ricard and Decathlon.